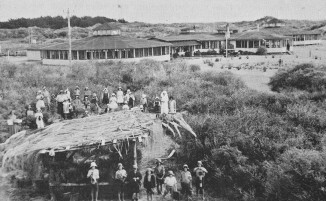 The two rotundas at the Otaki Children’s Health Camp in 1932, when it had just opened. The rotundas had been moved from Rotorua where they were built in 1916 as dormitories for the King George V Military Hospital for convalescent patients during the First World War. One rotunda still remains and is registered as a heritage building. The Otaki Museum read with some concern the item about the removal of Stand Children’s Services (formerly the Otaki Children’s Health Camp) to Paraparaumu. On the site at 29 Health Camp Road Otaki is a rotunda building which is registered with the Kapiti Coast District Council as a heritage building, and also registered by Heritage New Zealand which describes the building as “of outstanding national significance”. This building was one of two built in Rotorua in 1915 and opened in 1916 as dormitories for the King George V Military Hospital for convalescent patients during the First World War. After some time as a civilian hospital the two octagonal dormitories were moved to Otaki to become part of New Zealand’s first permanent children’s health camp, which opened in 1932. The buildings were temporarily used as hospital wards during the Second World War. One building was demolished c1963 and the remaining one was converted to a recreational building. For nearly 90 years this building has served as a health facility and it is probably the last World War I hospital building of this design remaining in New Zealand. It has high technological interest as its design reflects the attitudes of the day towards the treatment of the sick. It is also important for its association with nationally important figures such as Dr Ada Paterson and Dr Elizabeth Gunn, and also a locally important figure, the philanthropist Byron Brown who donated the land. We are very concerned that this building should be retained, conserved and an appropriate use found for it. We urge you to do everything possible to ensure this outcome. Breaking news: Health camp stays! The Board of Stand Children’s Services has completed due diligence and decided not to proceed with a proposal to move its Children’s Village from Otaki to Paraparaumu. Stand has been considering the purchase of a property at Milne Drive to allow it to relocate its Otaki Village. Dr Inkpen and members of the Board met with neighbours and other interested parties on the 29 January, as part of its due diligence process. The Board explained its plans for the proposed site and received feedback from residents. “Following our engagement with the community at Paraparaumu, our process has indicated to the Board that the purchase of 132 Milne Drive in Paraparaumu is not a viable option for us,” said Stand’s Chief Executive, Dr Fiona Inkpen. The Board will now pursue other options. The most likely option is staying at our current site in Otaki.